The driving force behind the JAVA - Red design was to offer more sonic possibilities to musicians while keeping the qualities of the original Java. More flexible than its elder version, with a little more tonal body, the JAVA - Red offers a full, rich, centered sound and excellent projection with an extremely precise attack. 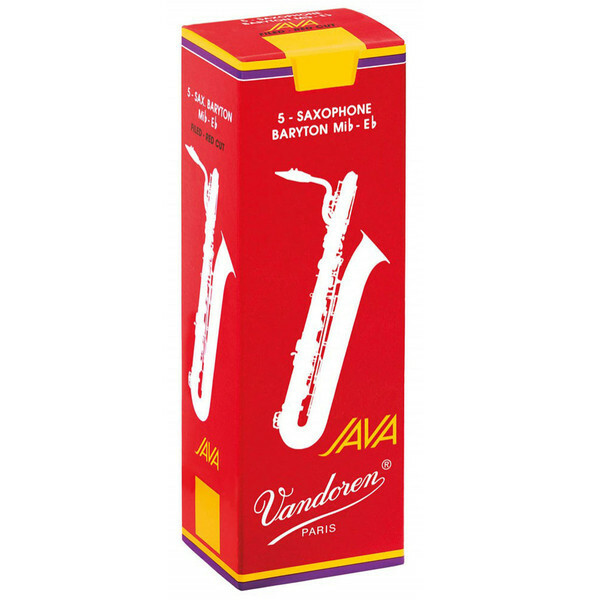 A relative of the JAVA reed family, the JAVA - Red is the first file cut Vandoren reed for jazz and popular music. It also benefits from a completely new design. For more information please observe the PDF document below. There are many important factors to consider when growing cane the specific qualities of our soil, hygrometry, the climate, a generous sun, the wind, which brings the cane to life, not to mention the experience and know-how of the people that grow it with passion. It takes no less than four long years of care and attention to bring cane to the point where it can bear the prestigious name of Vandoren. Cane is grown from rhisomes. In the first year, the cane reaches its final size and diameter. At the end of the second year, after gaining its body and strength, it is ready for harvesting. The cane is delicately cut with shears designed to avoid bursting the fibers; it is cut by hand in the tradition of the old journeyman carpenters. The harvest is carried out while the moon is descending, when the sap is utterly still. It is then stripped, cut into 6 foot sticks, and put out in the sun to take on that golden color that sometimes leaves brown marks. The cane is bundled and sent to Vandoren?s protected and ventilated warehouse to dry for another two years before manufacture begins. Once the cane is ready for manufacture, the first cut is made. This first cut produces the rough shapes in preparation for transformation into reeds. These rough shapes are beveled to an accuracy in the order of 1/100 mm, on the basis of a model created by Bernard Van Doren, whose knowledge, passed along for three generations, makes it possible to combine an endless number of lines and curves. Mr. Van Doren gives this little piece of cane a soul, which one day will be able to express itself with the musician?s talent. Every cane has its own character, with which the strength of the reeds is determined. No piece of cane can be identical due to the nature of this natural product. After the final inspection by trained craftsmen, the reed is stamped with its strength, receives the Vandoren logo, and is placed in a protective cover, ready to be packaged. Now the reeds are ready for musicians. Vandoren has professionals from all over the world play-test their reeds to insure that each reed meets with Vandorens high standards.